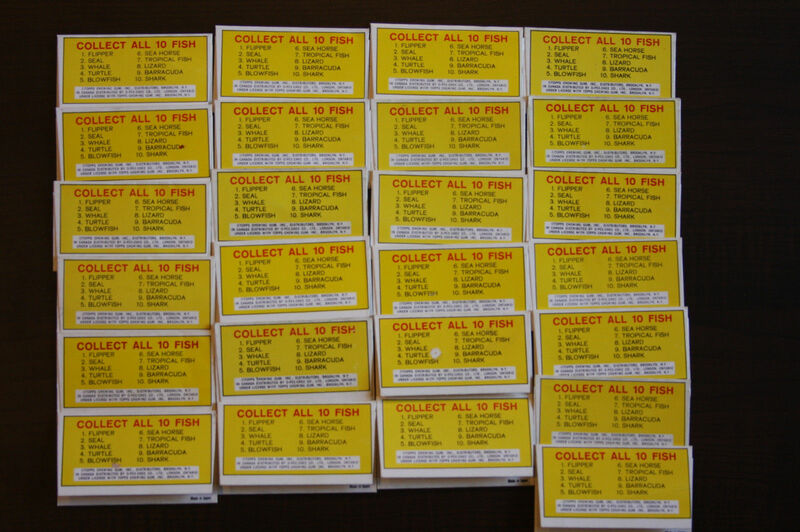 As we all know, Bowman asserted they had many baseball players under contract (340 as it turned out, vs 283 for Topps) when Topps issued their 1951 Baseball Candy sets (comprised of five subsets: Red Backs, Blue Backs, Connie Mack All Stars, Major League All Stars and Team Cards). Bowman tried a variety of legal tactics, one of which alleged they had exclusive rights to the term "baseball" when selling confectionery products with picture cards of baseball players and sued Topps in the Eastern District of the State of New York for trademark infringement. On March 31, 1952 Topps received a favorable ruling in the case, although they would be embroiled in appeals, suits and counter-suits for at least another eighteen months, losing most of them and really only getting the rights they coveted because the final owner of Bowman's parent company was selling most of his concerns to buy a larger firm unrelated to cards or gum. As you can imagine, the case hinged on testimony of witnesses, affidavits of same and the results of discovery and deposition. In addition to executives of both firms, player agents--who were third parties used to secure the contracts for Topps and Bowman and not the type of agents we think of today-- also figured. The agents who obtained signatures on most of the Bowman contracts were Joan Crosby and Jack Tanzer, who were employees of a firm call Art Flynn Associates; Topps used what looks like a wholly owned subsidiary called Player Enterprises for this purpose by the way. Interestingly, at least to me, the check in question was issued in 1949, a year before Bowman inserted the word "confections" into their player contracts. I'm not sure what that means but maybe that was the point of this particular deposition, i.e. 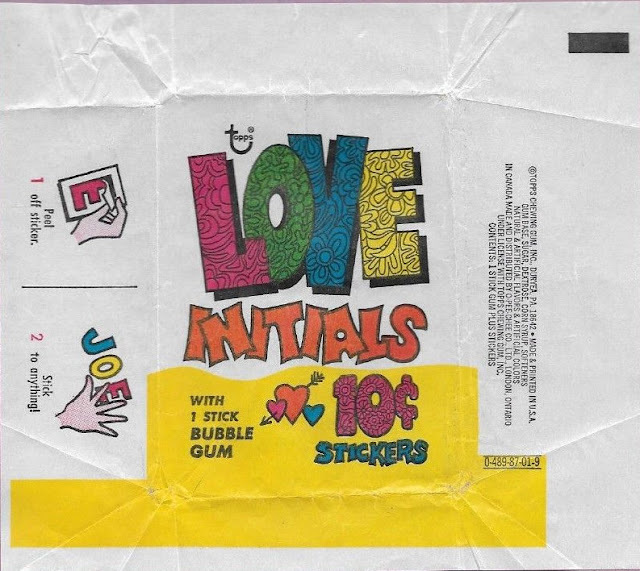 to show Bowman did not intend to specifically sell a combination of confections (gum) and baseball cards. I also find it interesting that Whitey, a starting outfielder for the New York Giants, cashed his check at a gas station in North Carolina during the winter of 1949! Whitey was a heckuva player for a time, take a gander. 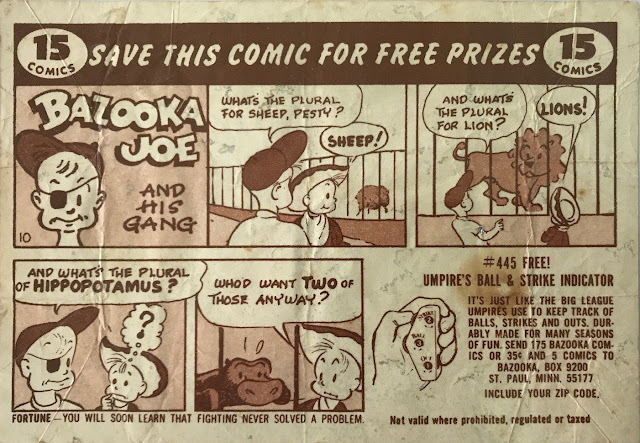 I wonder if more exhibits from the trial will pop up-it's possible a law firm book is being broken up and sold so we'll see but right now we have this fascinating bit of Topps (and Bowman) history. 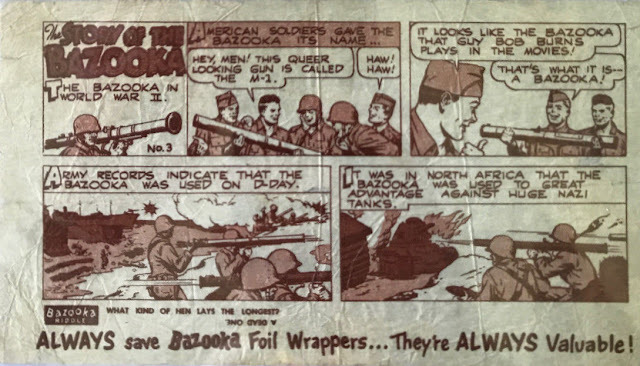 BFF o'the Archive Jeff Shepherd recently listed some rare Bazooka five cent foil wrappers on eBay, many with comics still attached to their underside. I've got a few of these myself (there's over a dozen different from the "foil" era), just added a couple of the below, and can attest how difficult these early Bazooka wrappers are. They are very delicate and very old, not a great confluence of circumstances for survival. Shep seems to have rounded up the rarest ones for this offering though. 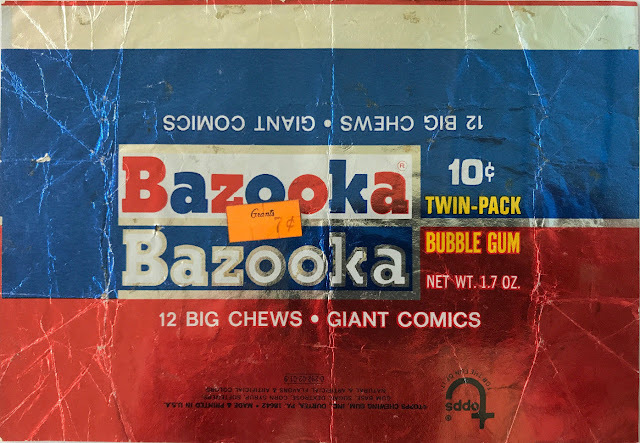 They only sold nickel packs of Bazooka until mid-1949 when the penny tabs came out but I'm not addressing those in this post. Yes, that is a reference to the Harlem Rens in the lower right corner, who were founded before the more famous Globetrotters. It seems like the fact the team had been together 28 years when the comic was released would help date the issue but it's complicated. The Rens were founded in 1923 but had moved to Dayton, Ohio after the war, disbanding after the 1948-49 National Basketball League season when the NBL merged with another league to form the NBA (the NBL was integrated, the NBA would not be until their second season), so....I think Mullin jumped the gun and missed the team's dissolution. So it's 1950-ish for this one. If you think that's one tough, here's an even tougher one, with two known comics having survived in the series. Topps obviously had an affinity for the bazooka! 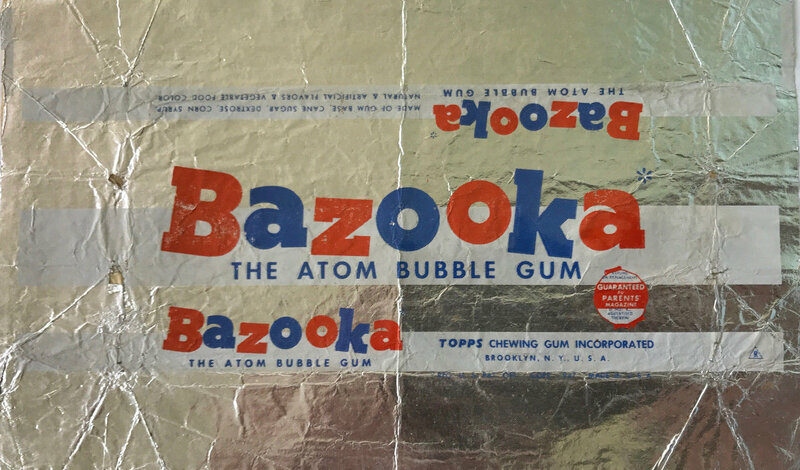 The Bob Burns story can be found here and and the Topps Bazooka story has been covered here before. 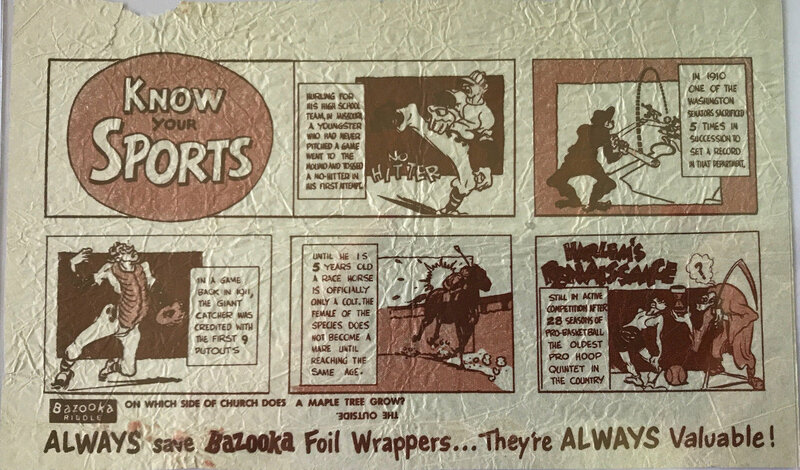 Click the links at right for a boatload of Bazooka posts if that one doesn't do it for you. Love the discount sticker from Grant's! Based on that fortune, I'll bet someone just got their clock cleaned! It's a little odd to see a sepia Joe in the late 60's but what the hey. Often when I post a blurry scan or two of something here, I get an e-mail sending along better quality pictures. A fairly recent post showing an uncut 1968-69 O-Pee-Chee Hockey Push Outs partial sheet garnered the attention of longtime Friend o'the Archive Bobby Burrell (who is pretty much the top authority on hockey cards and collectibles-check out his Vintage Hockey Collector guide!). Bobby has provided a much better shot of this 55 card partial sheet, one that's actually complete! 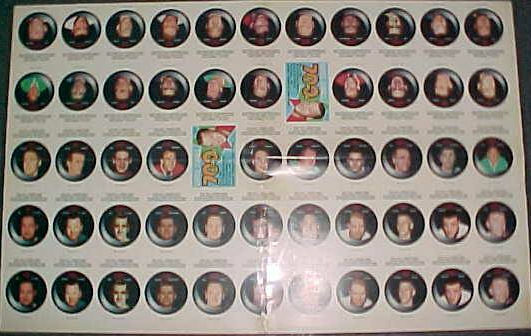 "The 1968 push out inserts were the very first insert for OPC in their stand along name being OPC away from Topps. They were inserted into the second of this two series issue. 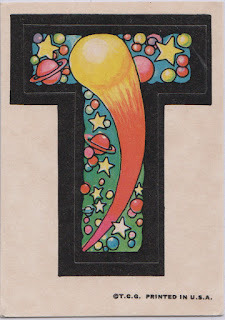 being done, almost every card has this small nick or pin hole, which doesn’t go through." 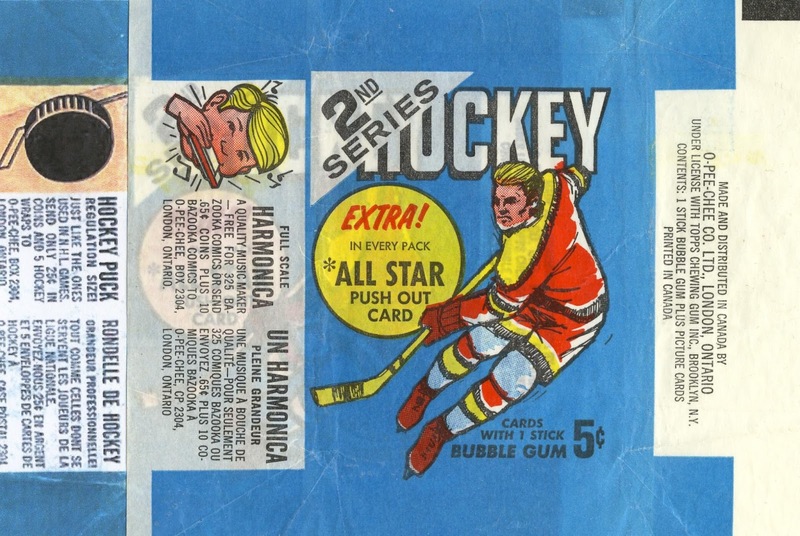 I think Topps and O-Pee-Chee had issues generally with die cut sets as you see a lot of partials like this from the era. 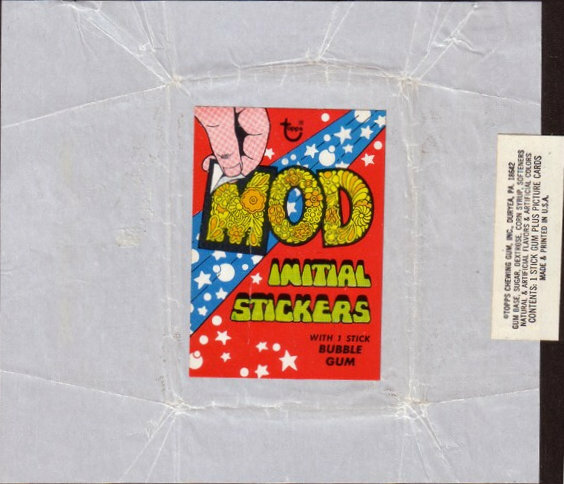 Those pinholes are also endemic on their earlier paper wrappers-the Topps Gum penny tabs that formed the first products of the company from 1938 had them as well. Puck or harmonica? You decide! 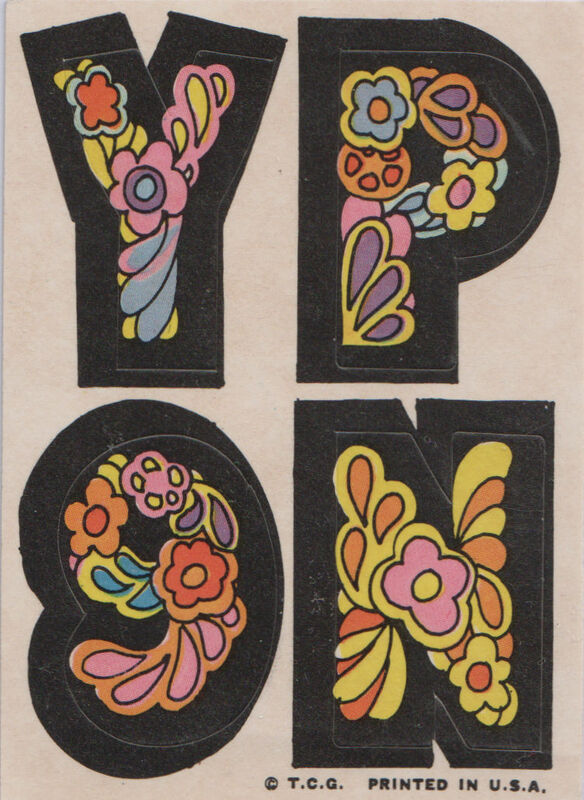 Thanks to 48 double prints, the 2nd series of OPC Hockey for 1968-69 indeed had 84 subjects, a very scarce number not divisible by the usual 11. My eBay search filters don't always work properly, a problem I am sure affects some of you out there as well. So I periodically survey what I've missed and while it makes a little sad and a little angry sometimes, it does yield some interesting results. About three months ago an auction featuring the largest stash of Flipper's Magic Fish I have ever seen ended. This 1966 Topps set could be their most obscure retail issue and once you see the pictures you will know why. 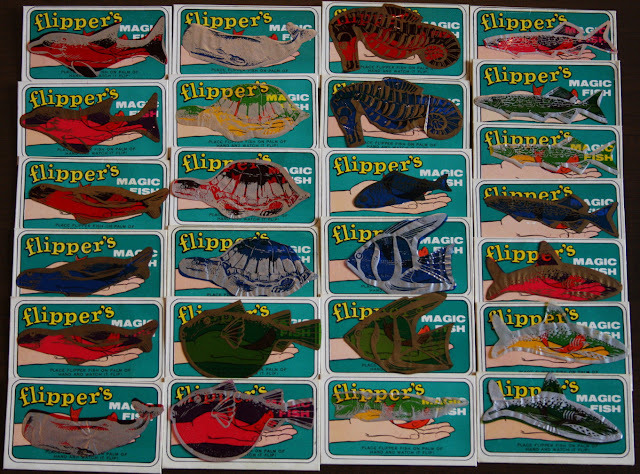 The instructions say "Place Flipper fish on palm of hand and watch it flip" which neatly eliminates any copyright or licensing provision-the only copyright belongs to Topps on the packaging. 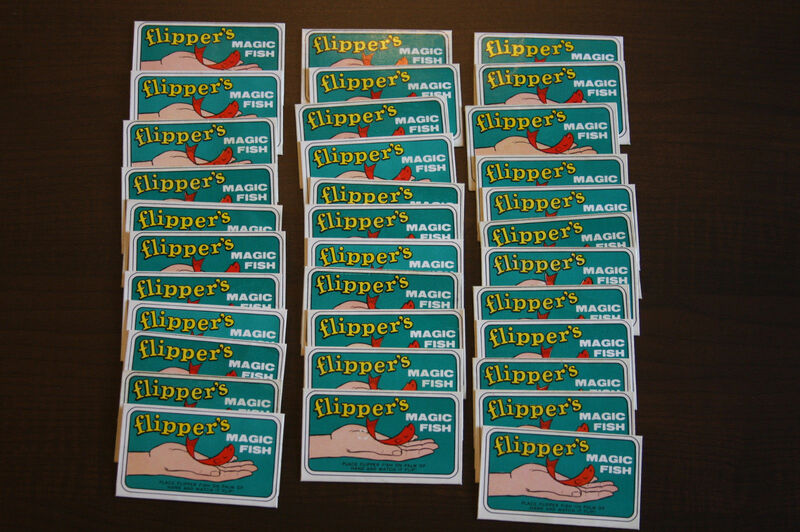 However, it seems possible to me that Ivan Tors Films and Metro-Goldwyn-Mayer, who were identified on the Flipper cards, may have thought differently. 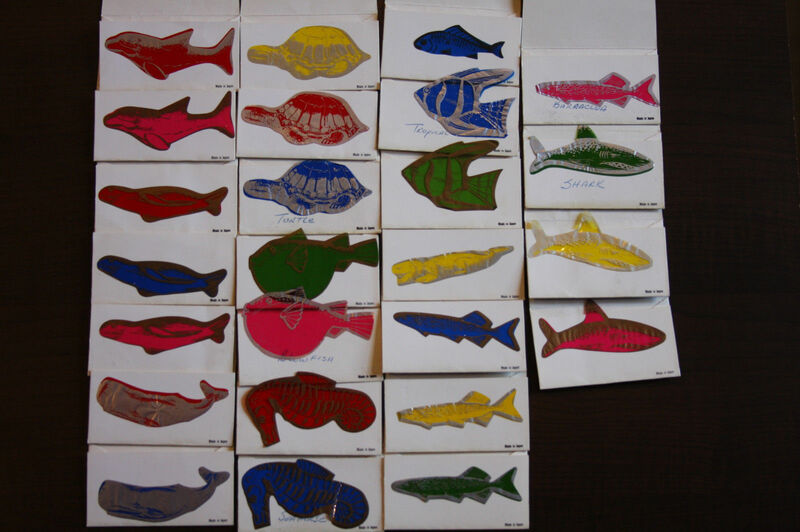 These fish are pretty tough to find and the available supply could indicate the set was curtailed or pulled shortly after debuting. Things happen when the package is flipped too! Given the array of colors above, it seems possible each subject had four different, for a total of forty fish varieties. I kinda like the turtle! 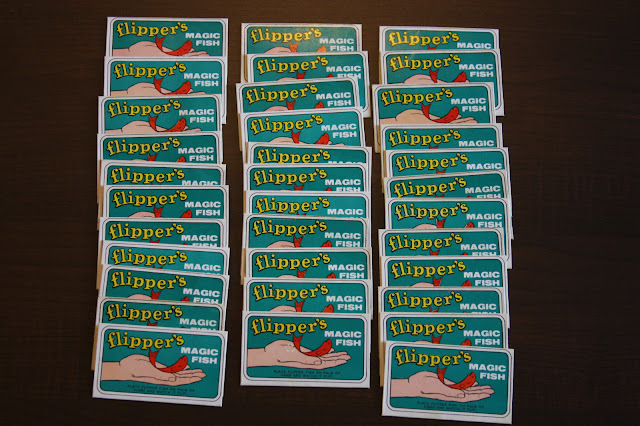 These were made in Japan and imported into the US, something Topps did with various non-confectionery related novelties in the mid to late 60's. These look pretty nice, especially when grouped like they are above. 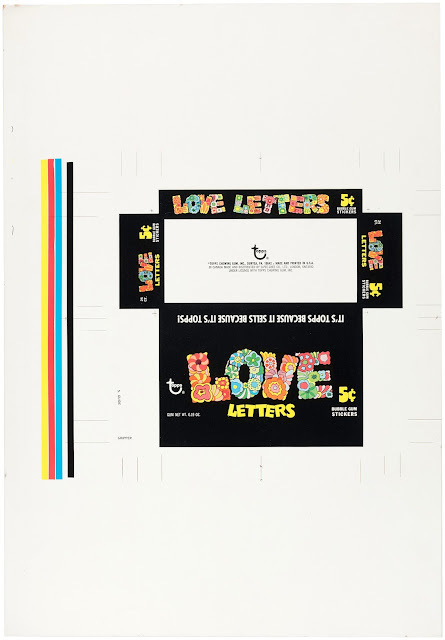 The story is that Love Letters became Love Initials, in the packs at least, in 1969 and before allegedly being reissued as Mod Initials in 1972. 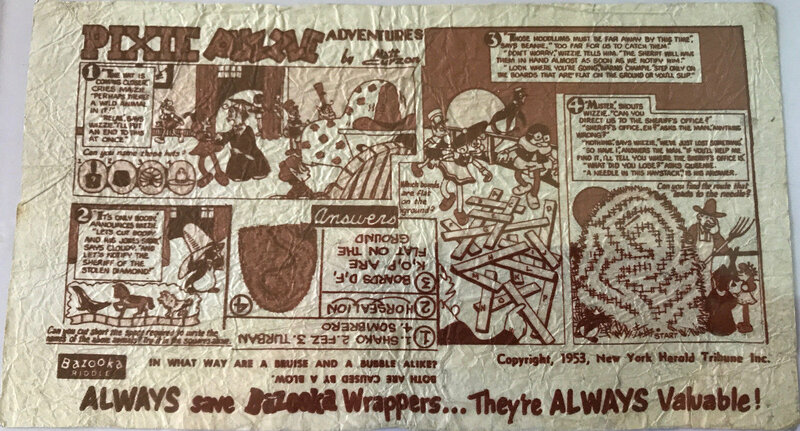 Topps did that sometimes, marketing a set with a slightly differing box and wax wrapper a couple of years after its first appearance. I assume the "letters" were thought by the brass to be confusing, hence the change to "initials" but who knows? 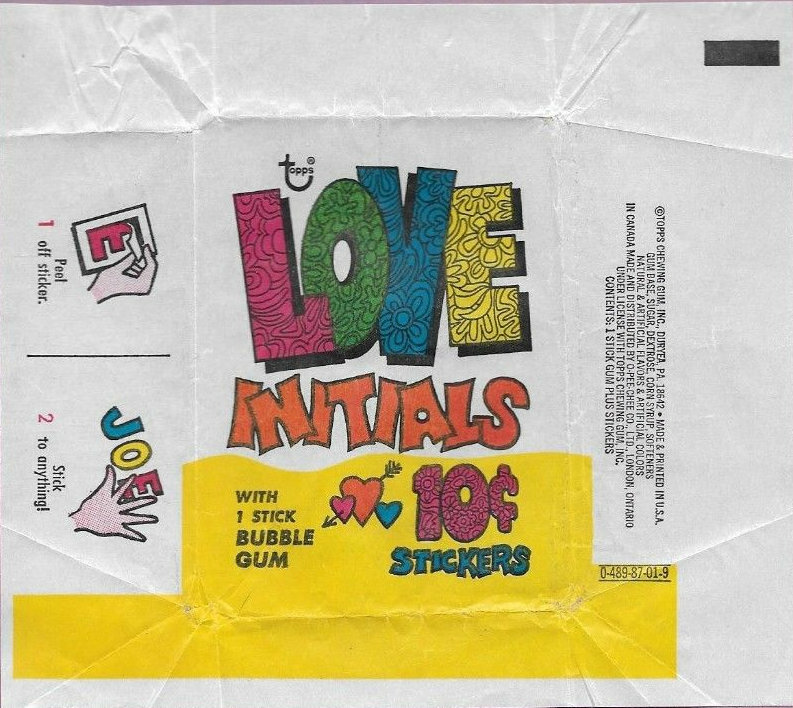 A ten cent box exists with (I am advised) a commodity number of 0-489-87-01-9 so the 10 cent wrapper above matches the box below.